Where can I buy this cosmetic filler? You can buy Revanesse Kiss from us and complete your order online or by telephone. 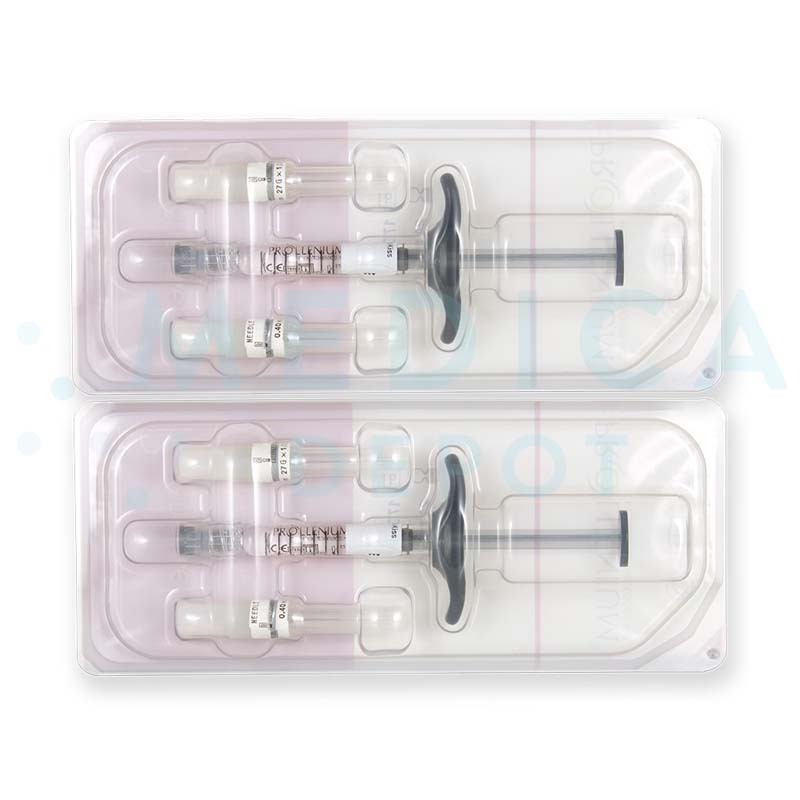 Enjoy the convenience of purchasing this and other dermal fillers online while benefiting from low wholesale prices. Contact our customer representatives if you need support completing your order or to order by telephone. Revanesse Kiss is a cosmetic filler made with spherically-shaped non-animal sourced hyaluronic acid particles. It is composed of 25mg/ml of hyaluronic acid molecules that are cross-linked using Thixofix Technology. The resulting gel is very viscoelastic and can even be injected through fine gauge needles smoothly. The uniform, spherical particles create a gel that is smoother for more natural-looking aesthetic improvements. Doctors can use this filler to augment and define the lips for a plump, contoured, and youthful appearance. This soft tissue implant is designed by Prollenium Medical Technologies Incorporation, a renowned Canadian pharmaceutical company. 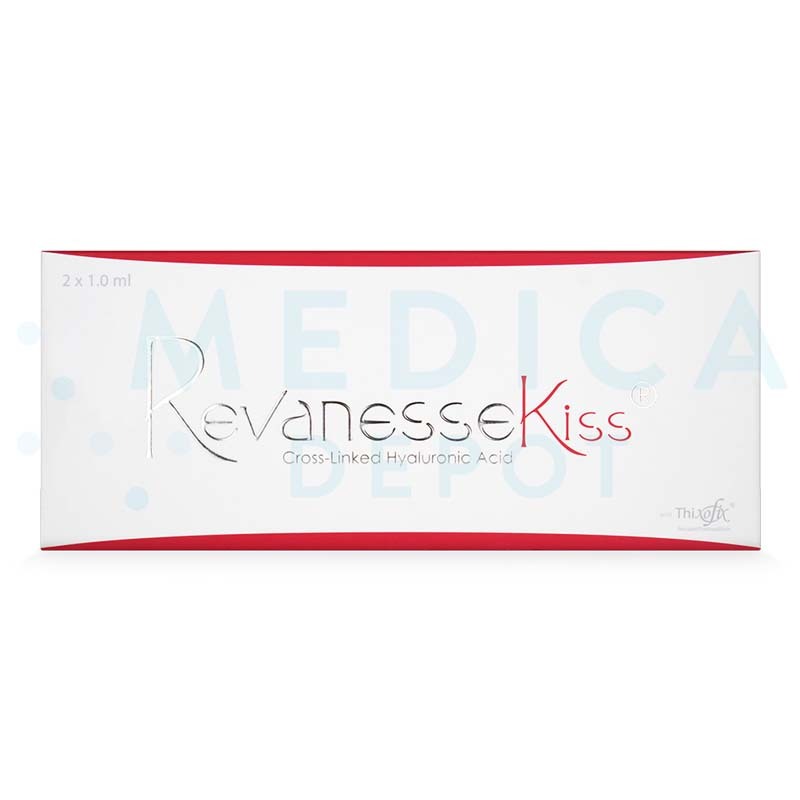 When you purchase a box of Revanesse Kiss, you will receive 2 syringes prefilled with cross-linked hyaluronic acid gel, 4-27G ½" needles, and the product leaflet. What are the benefits of this cosmetic filler? 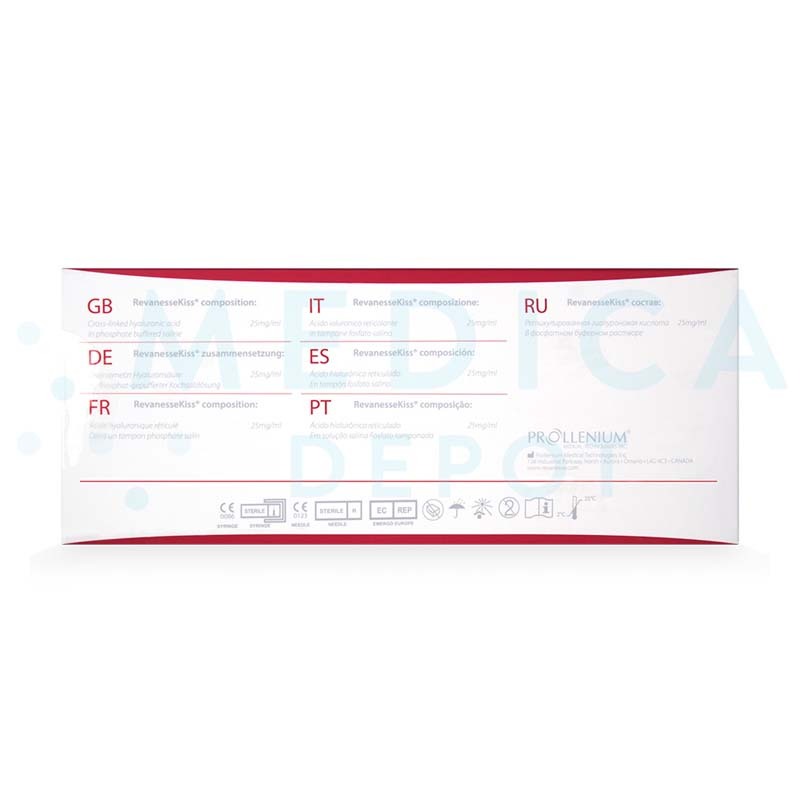 This brand-name filler from Prollenium, an innovative North American manufacturer, is certified genuine and is of high-quality. The filler material is made of hyaluronic acid, a natural substance trusted for its aesthetic benefits and tissue-friendly properties. The hyaluronic acid molecules that are extracted from fermenting bacterial cultures are extensively purified to be free from harmful contaminants. The highly-spherical hyaluronic acid particles create a more uniform gel for easy injection through fine-gauge needles, and natural-looking results. The highly viscoelastic gel is easy to mold for optimum results. Lip enhancements last for about 6 to 9 months after just 1 treatment. How does Revanesse Kiss work? This injectable gel is made of cross-linked hyaluronic acid particles that are spherical and uniform. This creates a gel that is durable, smooth, and malleable for more natural-looking results. Once you inject the hyaluronic acid gel into your patient's lips, the particles hold on to moisture, restoring both hydration and volume. This volume helps to support and define the lips, smoothen out wrinkles around the lips, and to add plumpness. What are the ingredients in Revanesse Kiss? This dermal filler contains 25mg/ml of cross-linked hyaluronic acid made of smooth and uniform particles. What is the difference between this and other Revanesse products? This particular filler is specially-made for use in the lips, with a smooth consistency that is less likely to cause swelling. Other Revanesse fillers, such as Original, Ultra, and Versa are meant for correcting facial wrinkles while Pure is meant for facial hydration. Leave at room temperature for half an hour before injection. Start the treatment session by cleaning and sanitizing the lip area. Assess your patient’s need for an anesthetic agent and administer it if required. Inject this hyaluronic acid gel into the lip mucosa using either a 27G or 30G needle. Gently mold the gel to the desired shape and position without overcorrecting the lips. Discard any leftover gel and used needles in a designated biological waste bin. When should I use this cosmetic filler? The treatment involves 1 injection. Repeat the treatments about every 6 to 9 months to maintain the results. The results of 1 treatment session can last about 6 to 9 months; however, the residence time of the gel can vary on an individual basis depending on the patient’s age, skin condition, health status, and lifestyle habits. The amount of filler administered and the type of injection technique used can also affect the duration of action. What areas of the body can I treat with this dermal filler? This dermal filler is specifically-designed for use on the lips for augmentation and shaping. Who is an ideal candidate for Revanesse Kiss treatments? The ideal candidate for these treatments is a patient who is experiencing loss of lip volume as they age or one who would like to augment their naturally thin or undefined lips. Why should I purchase Revanesse Kiss? Purchase this cosmetic filler to help your patients restore volume and shape to their aging lips. Revanesse Kiss is made by Prollenium, an innovative North American manufacturer, so you and your patients know you can count on this cosmetic injectable to provide quality results. The spherical particles help create a smooth gel for easy use and natural-looking results. 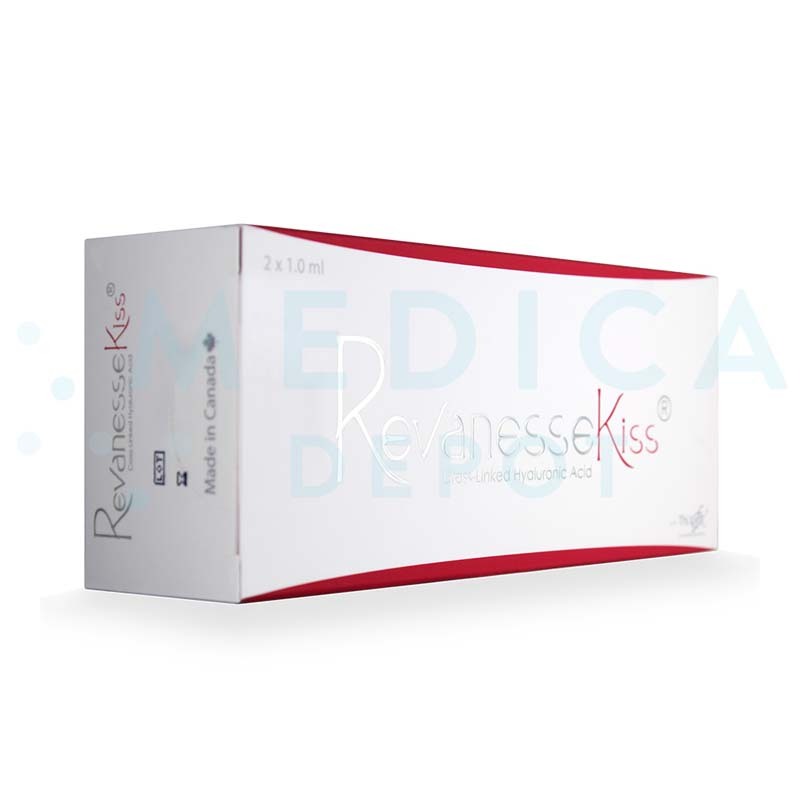 Most of all, by purchasing Revanesse Kiss from Medica Depot, you save money with low wholesale prices. What are Revanesse Kiss' side effects? Side effects usually resolve within a week after a lip injection. Any adverse health reactions that worsen or do not resolve should be followed up on. These may not be all the possible side effects; read the product leaflet carefully for other possible side effects.